William Butler Yeats, when he spoke admiringly about the ubiquity that songwriters like Rabindranath Tagore could achieve, had already made his forays into setting his poems to music. As a sometime playwright, and a founder of the Abbey Theater in Ireland, he was already familiar with the dimensions performers can bring to words. Around the turn to the 20th Century he began to forthrightly seek to combine his poetry with music. 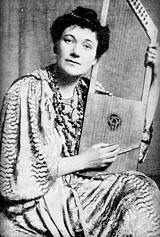 Working in collaboration with musicologist and luthier Arnold Dolmetsch and performer Florence Farr he had a psaltery (a stringed instrument like a lyre or small harp) constructed, and Farr (a fascinating figure in her own right) then performed Yeats poems with it. Yeats and Farr’s performance style was not a conventional art song setting of the poet’s words sung to a melody. Yeats explicitly rejected that (even though his words have often been set to melodies in the years since). Rather he thought the words were best chanted or intoned in a rhythmic and somewhat elongated speech. Such performances are controversial then, and I would suppose they would be controversial now as well. George Bernard Shaw called Farr’s chanting “A nerve-destroying crooning,” but Ezra Pound and other early 20th century modernists took note, and they were influenced by these performances to add a more incantatory and musical element to their poetry. Now let us break in our story for about half a century. In the late 1950s an actor and folk singer Burl Ives recorded an album of Irish songs, and one of them was “The Wondering of Old Angus”, a Yeats poem sung to melody that Ives claimed he learned from Sara Allgood, another actor who had performed with the Abbey Theater group and would have likely known of the Farr performances. Around the same time, another folk singer, Will Holt began singing the Yeats poem to a very similar melody, using Yeats’ title “The Song of the Wandering Aengus.” Then in 1962, Judy Collins, having learned the song from Holt, made it the title song of her album “Golden Apples of the Sun,” which is where I first heard it. No one seemed to know where the tune Ives, Holt, and Collins used came from. Those knowledgeable in traditional Irish tunes do not recognize it. Some credited Holt for it. However, early in the 21st Century a man named Bill Kennedy writing in the folk-song forum mudcat.org linked the tune to a transcription made by Dolmetsch accompanying a Yeats essay “Speaking to the Psaltery” re-published in the Saturday Evening Post in 1907. The tune there of course was not meant to be sung, as Yeats discussed in this essay, but it is recognizably the one used by Ives, Holt, and Collins in their singing renditions. So the tune may well be Yeats’ own, or perhaps it was composed by Farr or even Dolmetsch. Since the words are Yeats’, I’m going to call it, and make him the composer; and if so, that makes Yeats yet another singer-songwriter (along with Tagore and Dylan) to have won the Nobel prize. But he didn’t sing it, nor did he intend the words to be sung. Since we at the Parlando project are working in something like the same vein, here’s a version, using more or less that tune, but chanted not sung as Yeats suggested. Instead of the psaltery, I used fretless electric bass, some bowed strings and Mellotron to elaborate the tune. To hear it, use the player below, though neither Bernard Shaw nor I will be responsible for any nerve destruction. NOTE: I just noticed that I miss-typed “The Song of the Wandering Aengus” into “The Song of the Wondering Aengus” here. Oh my. This could be nerve destruction, or my hurry to get ready for a recording session this afternoon. Well, he is wondering after all!